Sole wants you to think he goes deeper than other MCs -- if you believe it, he's got you fooled, too. Sole is pissed off about something. Problem is, I'm not sure even he knows just what he's pissed off about. To date, the majority of Sole's fame has come as the brains behind and leader of Anticon, the label that generally gets filed in the hip-hop section of indie shops, but nobody quite knows what to do with. Rather than straight-up hip-hop, Anticon is typically a purveyor of poetry set to soundscape, with beats that lean closer to hip-hop than anything and words that sometimes get spat in a rhythmic (if not often rhyming) fashion. Sole himself sticks closely to this aesthetic, ranting about whatever it is he's thought up or written down over thick, claustrophobic beats provided by the Anticon producers of the moment. As of today, those producers include Odd Nosdam, Alias, and telephonejimjesus, and they comprise the entirety of that which is worth hearing on Live from Rome. Nosdam, coming off his gig with Clouddead, shows up and proves that the subtly schizophrenic style of his work on that project was no fluke, as he holds it down for six tracks. His beats change without warning, but the transitions are so well thought out and executed that a listener almost doesn't even notice that anything's different from one moment to the next. Nosdam is a producer whose productions require careful listening, but the wealth of sounds he uses and the effortlessness with which he wields those sounds results in a rewarding experience with every listen. Alias, another Anticon mainstay, takes a different approach, offering something that resembles mainstream hip-hop on the surface, but always carrying with it a deep undercurrent of dread. The slow-moving synth sounds of "Self-Inflicted Wounds" are beautiful in the way a dark, rainy day in the city is, and "Imsotired" is straight-up epic in a lo-fi sort of way. No, the problem here isn't the production. It's Sole himself. Anyone who's heard Sole before knows that he doesn't think he needs rhymes to be a respectable MC, and that's fine -- he would rather his words were referred to as "poetry" than "lyrics" anyway. He has a stream of consciousness style that hits on issues most wouldn't dare touch. 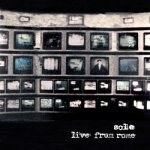 Unfortunately, on Live from Rome, Sole doesn't choose to explore any of those issues. Case in point: "Atheist Jihad", whose title alone lends it the air of politick, features the following: "Was you sad, but sorta smiled when the towers fell / There's only seven deadly sins, but you forgot about Sole and Bleubird / This is an atheist jihad, booyaka booyaka." Brain-dead chanting aside, that passage starts with a pretty powerful line, only to dismiss it in a bout of self-aggrandizement. "Children of bankers having plutonic weddings, watching heads roll / Christian rappers on Carson Daly, doing songs with Creed / My tongue on a toothpick at a European cocktail party," and so on and so forth, all on top of the exquisite Odd Nosdam production "Sin Carne". Maybe Sole is trying to come at us with an attack on the superficiality of everyday life, of the music industry, of peoples' interactions with one another. After suffering through an album full of non-sequiturs, however, I'm convinced that any deeper meaning that can be gleaned from it all is completely coincidental. Sole would rather shout slogans and make unsupported observations than go into any one topic in any sort of detail, and the effect is numbing. One or two songs in, the listener is convinced that Sole has something interesting to say; fifteen songs later, he's just an angry young man shouting about whatever. The late stages of the album attempt to draw the listener back with more conventional rhythms, deeper grooves, and even a few rhymes, but Sole throws away the renewed interest with lines like "You have no respect to give, I pray to you no more / Why do they choose egg substitute made out of egg, non-dairy creamer made out of milk?" His insistence on teasing us with a good line and immediately pulling away to something else, without even a rhyme as an excuse, is simply frustrating. "My music, my music is cheap entertainment," yells Sole on the "hook" of Live from Rome's leadoff track, "Cheap Entertainment". Surely some irony was intended in that statement. If only Sole had any idea how accurate such a dismissive assessment of his own product happens to be.